The ambient temperature sensor is installed in front of the condenser. It detects the ambient temperature to control air conditioning AUTO mode. 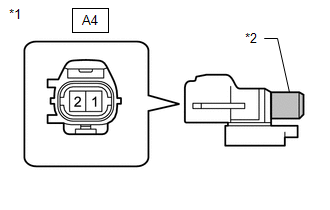 This sensor is connected to the A/C amplifier and detects fluctuations in the ambient temperature. This data is used for controlling the cabin temperature. The sensor sends a signal to the A/C amplifier. 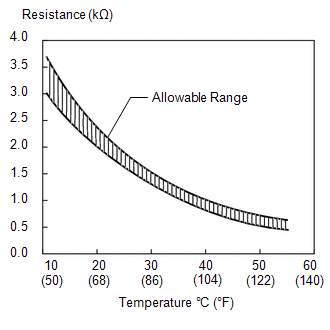 The resistance of the ambient temperature sensor changes in accordance with the ambient temperature. As the temperature decreases, the resistance increases. As the temperature increases, the resistance decreases. The A/C amplifier applies voltage (5 V) to the ambient temperature sensor and reads voltage changes as the resistance of the ambient temperature sensor changes. 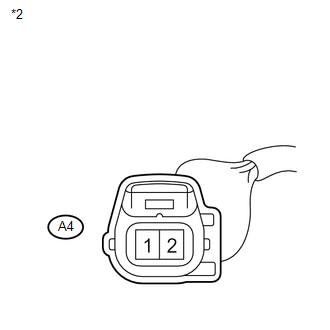 (a) Remove the ambient temperature sensor. 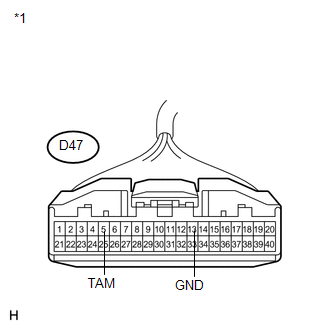 (b) Disconnect the ambient temperature sensor connector.